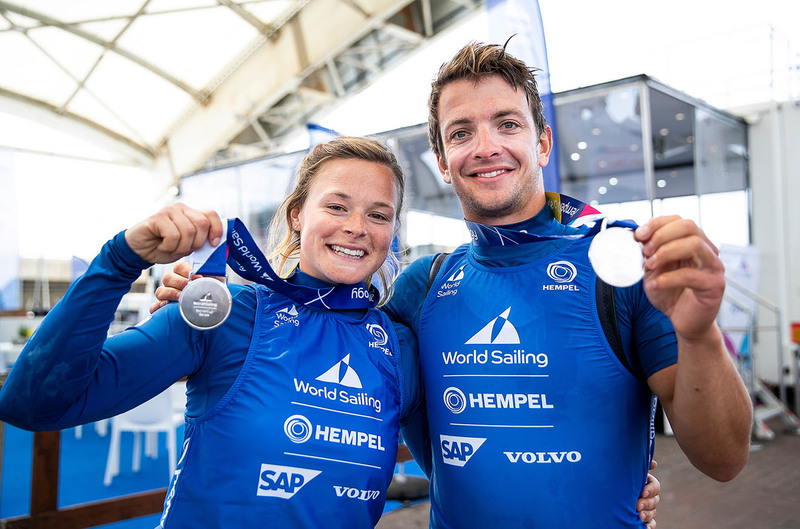 In the latest of our daily race analysis pieces from the Sailing World Championships, renowned sailing expert Mark Chisnell looks at how world championship bronze medallists Hannah Mills and Eilidh McIntyre kept their options open. It was a beautiful day for racing at the Hempel Sailing World Championships with bright sunshine and a 7-9 knot south-easterly. It’s great to be able to report the fact on the first of four Medal Race days. The 470 Women came to the line with Hannah Mills and Eilidh McIntyre in a bronze medal position. They could take gold if it went to plan, but it didn’t – and they had to pull off a brilliant recovery on the third leg to save their bronze medal and stay on the podium. It all started to go bad for Mills and McIntyre at the gun. There was an X flag for individual recalls, and they judged that they were over the line and went back. 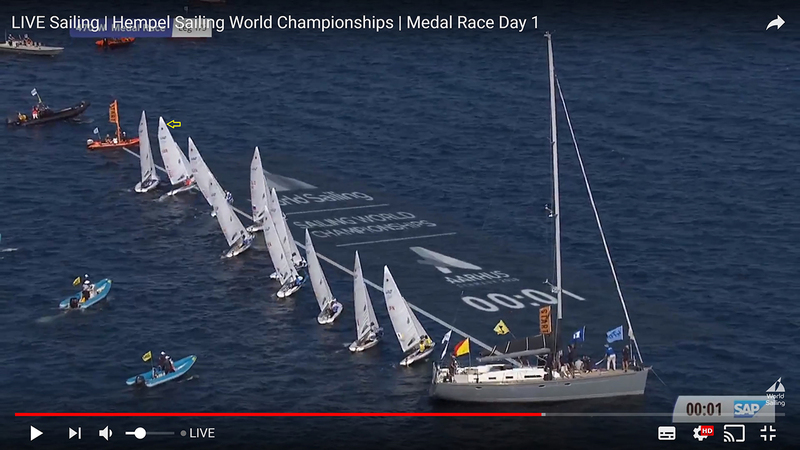 We can see it in Video 1 – Mills and McIntyre in GBR1 were the second boat up from the pin end at the top of the screen. The audio on the video indicated that they weren’t called over early, but at the other end of the line they had no way of hearing that. 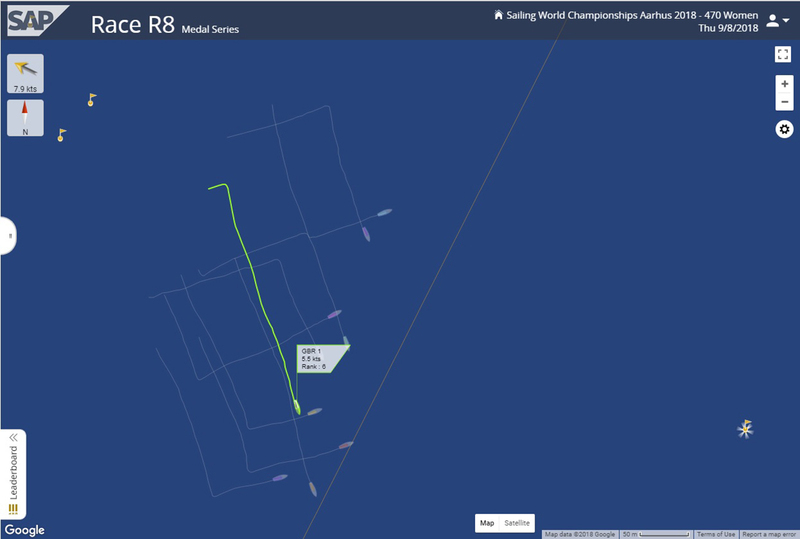 And if you look at Image 1, I think you can see why they were smart to go back, along with the other British boat of Amy Seabright and Anna Carpenter. The problem was made worse by the fact that the Spanish boat in fourth overall was sailing really well and eventually led all the way around. To recover their bronze medal Mills and McIntyre had to get back in front of the French team in FRA9 and then put two boats between them. Let’s see how they did it. There was very little change on the first lap, and early in the third leg Mills and McIntyre (highlighted in lime green) were in eighth place as we see in Image 2. While they still had plenty to do they had created a platform for a recovery – separated from the pack, and free to pick their own route up the leg. 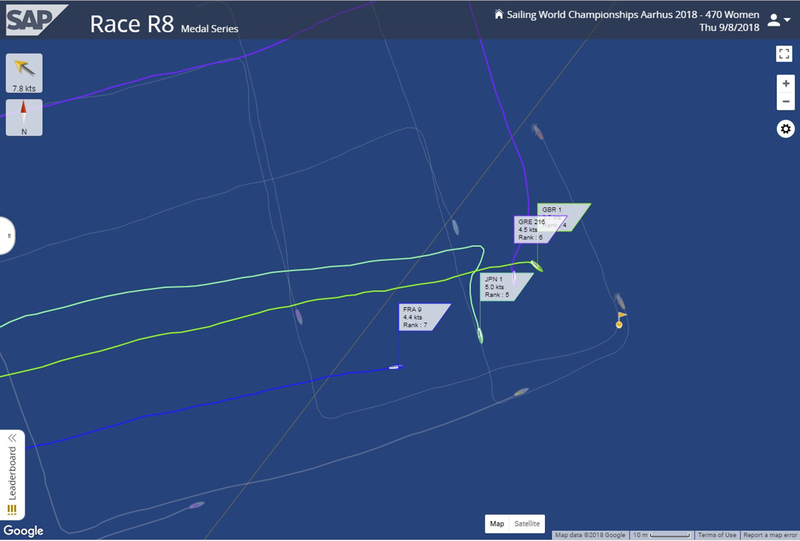 They got a left-hand (anti-clockwise) wind shift and went back onto port to take advantage of it. By the time they were back in the centre of the course the analytics had them up to sixth as we can see in Image 3. 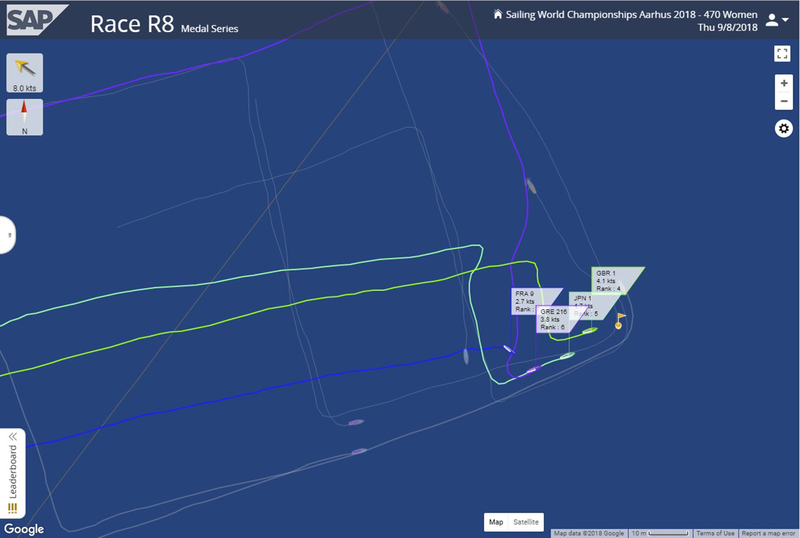 There was no clear lane to get onto starboard, and given that they were only just right of the centre of the course it was no surprise that they kept going. 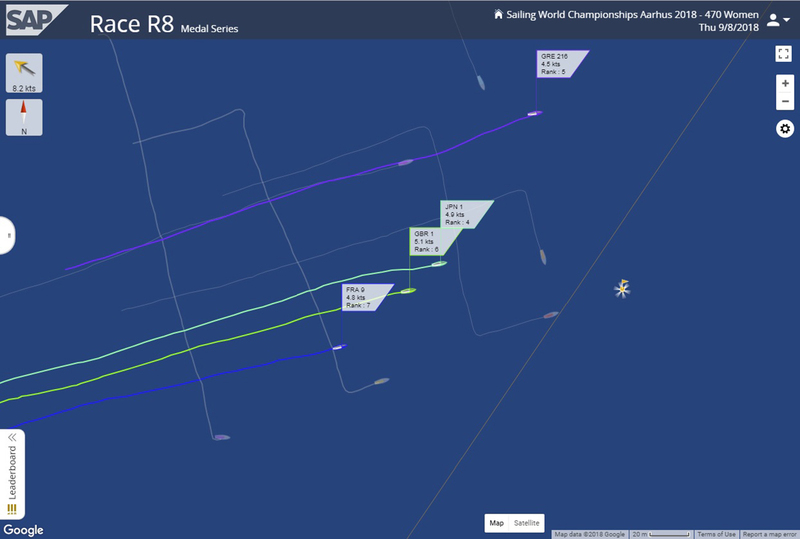 In Image 4 we can see that a clear lane had finally opened, and by now they must have been feeling a little exposed on the right-hand side (looking upwind) of the race course. They were a long way out to try to pick a layline – even if they had wanted to, which I very much doubt – and so they tacked as soon as they had the clear lane. 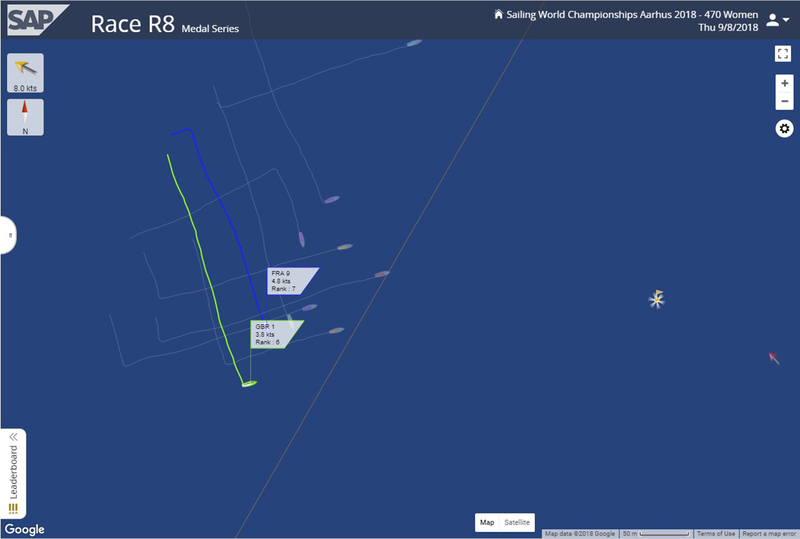 The French boat that they had to beat (FRA 9 highlighted in blue) was one place behind them and continued out to the right. This was really the key moment when Mills and McIntyre kept their options open, and the French crew closed theirs out. It was far from assured that the British team would make a gain on this leg at this point, but as we can see in Image 5 they had put themselves in a position with potential. They were just below the layline and could gain from a wind shift either way. If it lifted (moved clockwise as you face the wind on starboard tack) they had a shot at making the buoy. If it headed (moved anticlockwise) they still had the runway to tack and get onto port to make a gain. 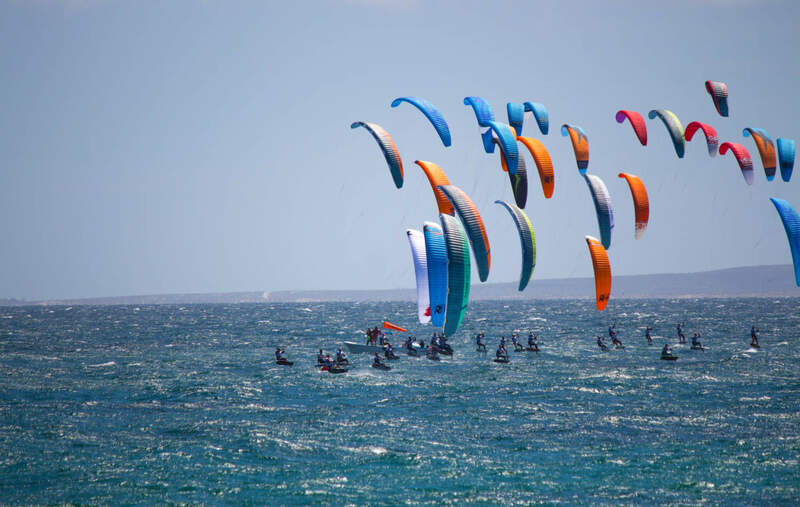 They had options, and not just for any shifts in the breeze – not being on the layline meant they also had choices in how they dealt with the traffic when everyone converged at the top mark. And it was the latter where they really came good. The two boats closest to their left – JPN 1 highlighted in light green, and GRE 210 highlighted in purple – both had to come back towards them on port. 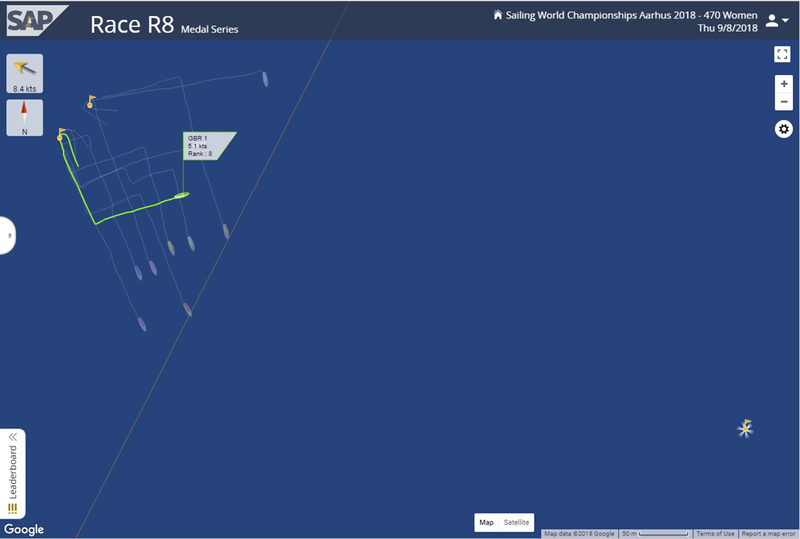 In Image 6 we see that by coming in on a good right-hand wind shift, Mills and McIntyre have been able to use their right of way on starboard tack to force both those boats to duck behind them. 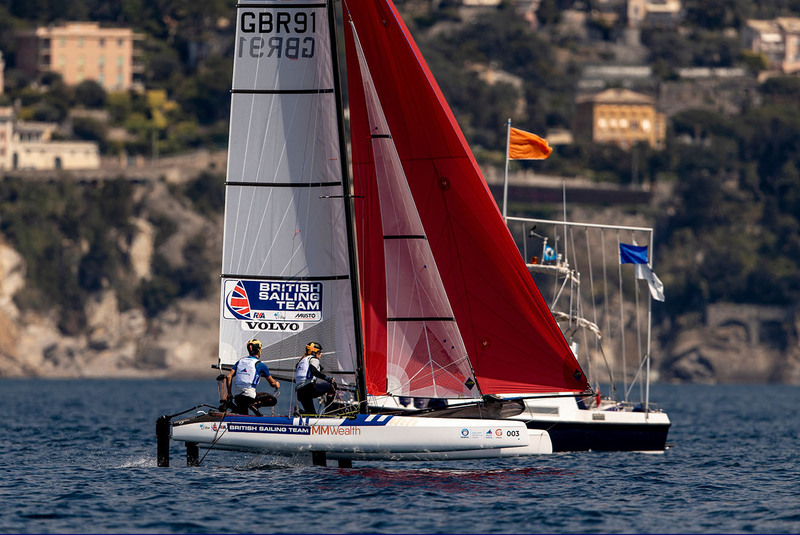 In Image 7 we see how two beautifully executed tacks then popped them out in front of both the Japanese and the Greek boats to take fourth place around the top mark. They dealt with all the traffic without losing a meter. It wouldn’t have happened if they had approached on the starboard tack layline. Video 2 also shows a little bit of the action. The move created the points buffer that Mills and McIntyre needed between them and the French team, and they held it to the finish to take the bronze medal. It was a quite remarkable recovery when you consider the distance they had to make up and the boats they had to pass off the line – top tekkers, no doubt. Previous PostWatch the Laser Standard and Radial medal races - LIVE!